ORIGINAL OMA BRAND. OMA® is a registered brand with the US Patent and Trademark Office. Our logo, brand, and slogan are all intellectual property of One Thousand Artisans. One Thousand Artisans is the ONLY authorized DISTRIBUTOR AND SELLER of this brand in North America. Look for the Original OMA BRAND- Product quality/ authenticity NOT GUARANTEED IF PURCHASED THROUGH ANY OTHER VENDOR BESIDES US! If you have any questions about this product by OMA, contact us by completing and submitting the form below. If you are looking for a specif part number, please include it with your message. 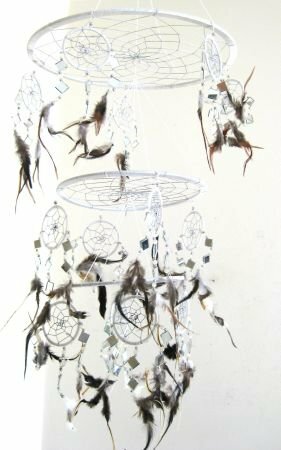 Howling Wolf Dream Catcher 13" Beads and Feathers 2 Rings.